Marinate the salmon with 2 tbsp of soy sauce, 2 tbsp of sesame oil and 2 tbsp hoisin sauce for a few hours. Cook the noodles according to package. Put the fish in the oven for 10-15 minutes. Meanwhile sauté the veggies with a little bit of sesame oil, the garlic and ginger, add 2 tbsp of water, cover and let it steam for 5 minutes, until veggies are cooked. Add 1 tbsp of soy sauce and toss in the pasta cooked pasta. 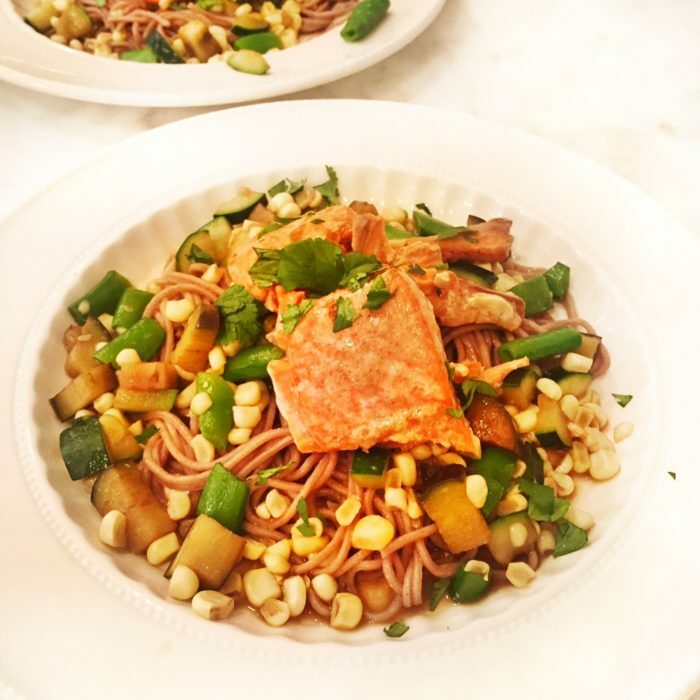 Serve with the pasta on plates and top with the salmon and chopped cilantro.